Recent commentary has highlighted inconsistencies between international legal concepts (norms and rules) and the capacity of States to adopt or implement them.1 In some cases, the State legal systems in place are readily able to accommodate the dynamic new norms that have evolved from rapid changes in contemporary international values or policies (e.g., in respect of torture, trade, greenhouse gas emissions, etc.). When this is not the case, the obvious conclusion is that legal operating systems need to adapt, or imbalances are likely to persist and new norms will not be given full effect.2 The Convention on the Conservation of Antarctic Marine Living Resources (CAMLR Convention)3 is a longstanding international agreement that celebrated its 25th annual meeting in 2006. 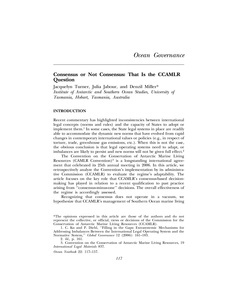 In this article, we retrospectively analyze the Convention抯 implementation by its administrative Commission (CCAMLR) to evaluate the regime抯 adaptability. The article focuses on the key role that CCAMLR抯 consensus-based decisionmaking has played in relation to a recent qualification to past practice arising from 憫consensus-minus-one拻 decisions. The overall effectiveness of the regime is accordingly assessed. Recognizing that consensus does not operate in a vacuum, we hypothesize that CCAMLR抯 management of Southern Ocean marine living resources comprises at least four essential elements: cooperation, compromise, consensus, and compliance. To help explain how CCAMLR functions, a particular methodological template is applied to these elements to ascertain if it is possible to place them within either an operating or a normative system or sometimes both. As Figure 1 shows, the elements are essentially discrete, but linked; we emphasize this point by illustrating how they interact. Our study begins by exploring CCAMLR抯 history and how cooperation has been achieved even though the overriding interests of the States involved encompass a commercially competitive activity (harvesting). Like many international legal instruments, the Convention抯 negotiation invariably led to compromises. The Chairman抯 Statement, appended to the Convention, is itself a built-in compromise on the application of CCAMLR抯 jurisdiction. Finally, we examine what is meant by 憫consensus拻: how it operates to underpin compliance, and what the emerging notion of 憫consensus-minusone拻 implies. Our primary objective is to establish if the current CCAMLR decision-making process actually improves compliance梐 reasonable expectation that indicates if the regime is working effectively.